2 strawberry flavored Special K bars (180 calories). Exhausted this morning since I only slept about 3 and a half hours. Could barely function, and certainly was going to be late for for lab, so I quickly ate the two bars and got ready to leave. Today's going to be a long and painful day. Sesame chicken from Goosebeary's food truck: ate 5 oz. chicken (450 calories), 1/2 cup of white rice (100 calories), and 1/2 cup of mixed vegetables (25 calories). The chicken was actually kind of dry, since they didn't pour enough sauce on top (guess they just use generic dry chicken and top with sauce to make the "dish" of the day). So it wasn't all that appetizing. I don't know, I like my food to be saucy haha. 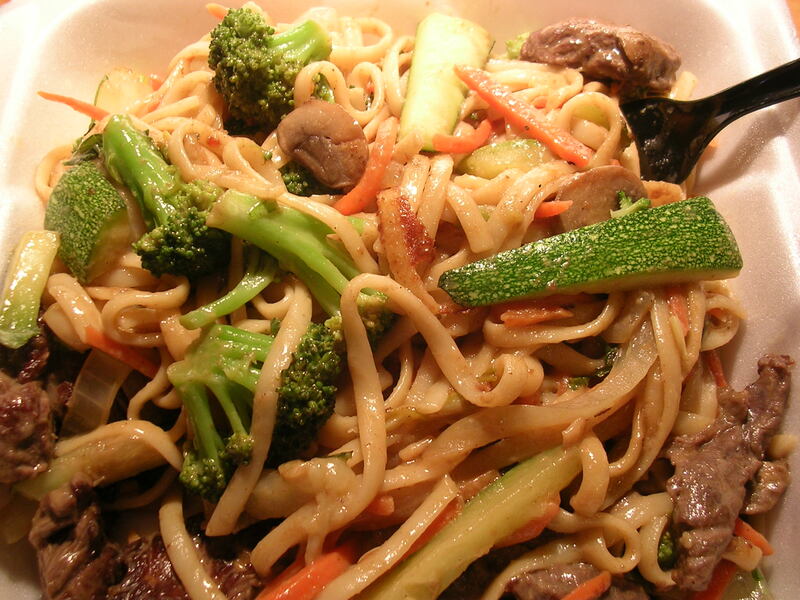 1/2 of a stir fry entree: 3/4 cup of mixed vegetables (~40 calories), 3/4 cup of linguine (150 calories), 3 oz. lean beef (180 calories), in curry lime and hoisin peanut sauce (~100 calories?). I love it when Baker's stir fry cook, Jesse, makes his curry lime sauce, because it goes so well with the hoisin peanut. Alone, curry lime is too tart (has a lot of lime juice in it, and the curry is rather mild), and the hoisin peanut is too salty. But together, there's a perfect blend of flavors where the salty of the hoisin is toned down by the mild creamy curry, and the lime adds some zest with its tartness. I'm saving half of the entree for lunch tomorrow since it's another busy Tuesday. 1/3 of an imperial torte cake slice (~100 calories) + 1 Viactiv vitamin. I love tortes, can't you tell? :P This one has a bottom layer of sponge cake soaked in orange flavored syrup, while the rest of the cake layers are unsoaked. 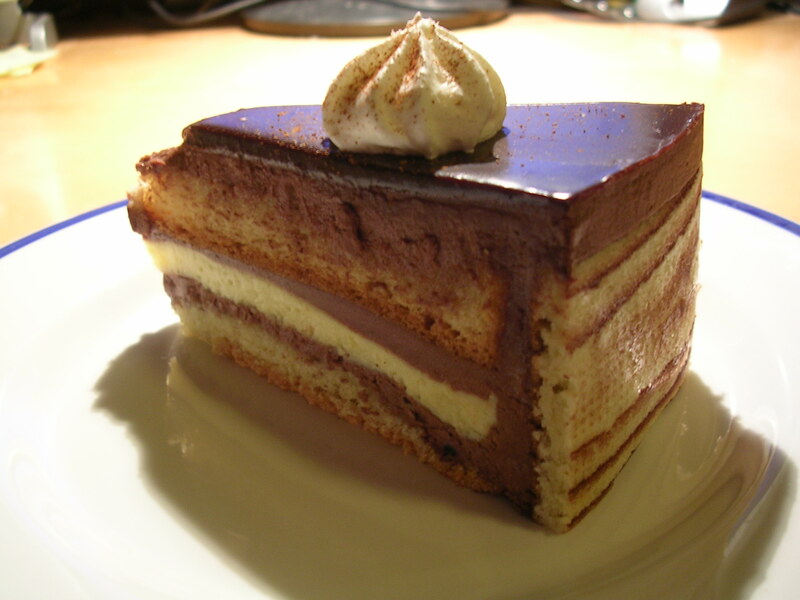 In between the bottom two layers is some chocolate mousse along with a layer of bavarian custard. The rest of the cake layers have chocolate mousse around between them, and the top is finished off with some fruit flavored glossy coating. Very delicious, but less dense than the chocolate mousse torte I had last week. Also very pretty! 1 asian pear (100 calories). I should invest in some more types of fruit. I'm rather fond of oranges, grapes, melons, and papaya. They would all be good late night snacks. I might invest in some cereal too. It's always kind of hard to keep the hunger away when staying up so late. I read that to keep your appetite in check and metabolism going, you should be eating on average about every three hours. That starts to really break down after dinnertime because there's just nothing left to eat yet I'm still up for another 9 hours on average. It's always tempting to reach for sweets like cookies and stuff that I have in my room, so I want to have some other alternatives on hand. We'll see if I have time over spring break to stock up. Total for today comes to 1425. It's kind of amazing when you really start to put effort into it how much of a difference you can make in your eating. I consciously set aside half of my stir fry dinner into a tupperware for tomorrow's lunch. What was left over for me to eat looked really measly and I was worried that I wouldn't have enough to fill me up. But pleasantly, to my surprise, by the time I finished what was in my dish (I left the saved half out so I could dig into it if I felt like dinner wasn't enough haha), I was comfortably satisfied. Normally I would have just eaten the whole stir fry, I mean it's just so easy to do and especially when it tastes good you want to just eat a good deal of it right? (Or maybe I'm just being a glutton lol). Plus I think I'm used to looking at foods in certain portions that are served on a regular basis. It's like my brain has been wired to believe that I need to eat a certain volume of food to be full. (Remember Tony that summer we started out eating a lot of food but then adjusted to eating less and still being full?) So when I looked at what I portioned out for myself, I immediately thought oh my god this isn't going to be enough. I guess I have to listen to my stomach a little more and be a little less greedy about what I eat. That said, it's always nice to be able to dig into a big plate of food that you love and just eat until you're super full haha. You know, a while back I used to be so envious of people who could literally eat whatever they wanted and never put on weight. But then I learned that the fat they don't build on top of their muscles actually is building up around their internal organs. So that they are "fat on the inside". In fact, this internal organ fat is much worse than the stuff we have under our skin, because it supposedly indicates that the system is in a lot worse shape (buildup in arteries, assulting the liver, etc). And it's especially dangerous because these people obviously have no idea that it's going on, since their bodies don't give them any visual indication of unhealthiness. My boyfriend's brother is rail thin, and his diet basically consists of entirely canned chili, rice, and canned dace. I can't imagine it's very good for him at all. Anyway, I digress. The next time you see someone who's really thin and eats horribly unhealthy, don't be jealous of them. They're possibly worse off than the rest of us who have to watch what we eat. This entry was posted on Monday, March 19th, 2007 at 3:47 pm	and posted in beef, Chinese, desserts, fruit and nuts, poultry, snacks, Uncategorized. You can follow any responses to this entry through the RSS 2.0 feed.